Under the provisions of the New York Constitution of 1846, 32 Senators and 128 assemblymen were elected in single-seat districts; senators for a two-year term, assemblymen for a one-year term. The senatorial districts were made up of entire counties, except New York County (five districts) and Kings County (two districts). The Assembly districts were made up of entire towns, or city wards, forming a contiguous area, all within the same county. On April 25, 1866, the Legislature re-apportioned the Senate districts. The new apportionment was first used at the election of 1867. According to the Constitution of 1846, twenty years after its elaboration the electorate was asked if they wanted a Constitutional Convention to be held, which was answered at the New York state election, 1866, in the affirmative. On April 23, 1867, the delegates to the Constitutional Convention were elected, resulting in a Republican majority. On June 4, the Constitutional Convention met at Albany; adjourned on September 23; and met again on November 12. The New York state election, 1867 was held on November 5. All eight statewide elective offices up for election were carried by the Democrats. The approximate party strength at this election, as expressed by the vote for Secretary of State, was: Democrats 373,000 and Republicans 325,000. The Legislature met for the regular session at the Old State Capitol in Albany on January 7, 1868; and adjourned on May 6. At the same time, the Constitutional Convention continued in session. William Hitchman (D) was elected Speaker. On January 15, Charles J. Folger (R) was re-elected President pro tempore of the State Senate. On February 12, the Legislature elected Matthew T. Brennan (D) to take office on March 1 as a Metropolitan Police Commissioner, for a term of eight years. On February 28, the Constitutional Convention adjourned sine die. How to put the proposed amendments before the electorate was then debated throughout this and the next Legislature, and all amendments, except the re-organization of the judicial system, were eventually rejected by the voters at the New York state election, 1869. 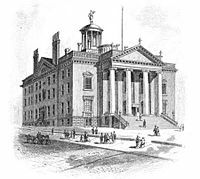 On March 31, the trial of Canal Commissioner Robert C. Dorn (R) opened before the New York Court for the Trial of Impeachments, consisting of the State Senate and the judges of the New York Court of Appeals. Assemblymen William S. Clark, John L. Flagg, John C. Jacobs, John F. Little, William Lounsbery, Alpheus Prince, William B. Quinn (all seven Dem. ), Nicholas B. La Bau and Edmund L. Pitts (both Rep.) appeared as the Managers to prosecute the impeachment. Smith M. Weed (D) appeared as Counsel for the Managers. Henry Smith (R) and John H. Reynolds appeared for the defense. On April 7, the Legislature elected Abram B. Weaver (D) to succeed Victor M. Rice (R) as Superintendent of Public Instruction for a term of three years. On April 9, Assemblyman Elijah M. K. Glenn (R) accused Assemblyman Alexander Frear to have offered him on March 27 a bribe of $500. On April 10, a select committee appointed to investigate concluded that "the evidence does not furnish any justification for the charges made by Mr. Glenn against Mr. Frear." Thereupon a resolution was passed to censure Glenn. On April 11, Glenn resigned his seat. On June 12, the impeachment trial ended with the acquittal of Dorn on all articles. The asterisk (*) denotes members of the previous Legislature who continued in office as members of this Legislature. Thomas J. Creamer and Henry W. Genet changed from the Assembly to the Senate. Party affiliations follow the vote for Senate officers. The asterisk (*) denotes members of the previous Legislature who continued as members of this Legislature. Nicholas B. La Bau changed from the Senate to the Assembly. Party affiliations follow the listing in the Life Sketches. ^ Except New York City where the wards were apportioned into election districts, and then some whole wards and some election districts of other wards were gerrymandered together into Assembly districts.